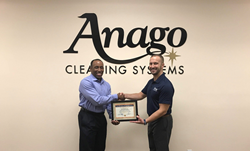 Anago Cleaning Systems (Anago), an industry-leading commercial cleaning franchise with over 35 Master Franchise locations and over 1,500 Unit Franchises throughout the U.S. and internationally, is pleased to announce its newest Las Vegas Master Franchise Owner, Chris Hammond. Hammond, originally from Dallas, Texas, has over 20 years of experience in business management and has held multiple executive leadership positions in the retail, healthcare, financial, government and telecommunications industries. In his most recent endeavor, Hammond served as the Director of Call Centers for Consumers Credit Union. Additionally, Hammond’s sales, management, and leadership expertise will play a crucial role in helping to expand Anago’s footprint in Las Vegas. Anago of Las Vegas is located at 2881 South Valley View Blvd, Suite #7 Las Vegas, NV 89102.